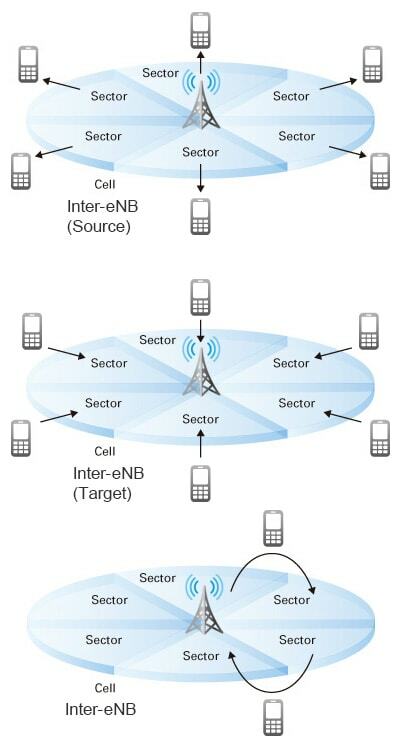 Handover procedures are a key function of LTE eNBs. 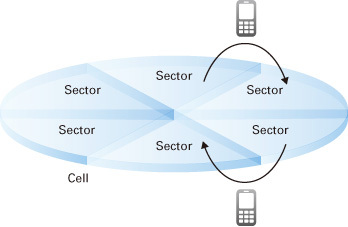 They are intended to reduce interruption time compared to the circuit-switched handover process in 2G networks. Thoroughly evaluating the performance of LTE eNBs requires testing multiple handover procedures, shown in the table below. 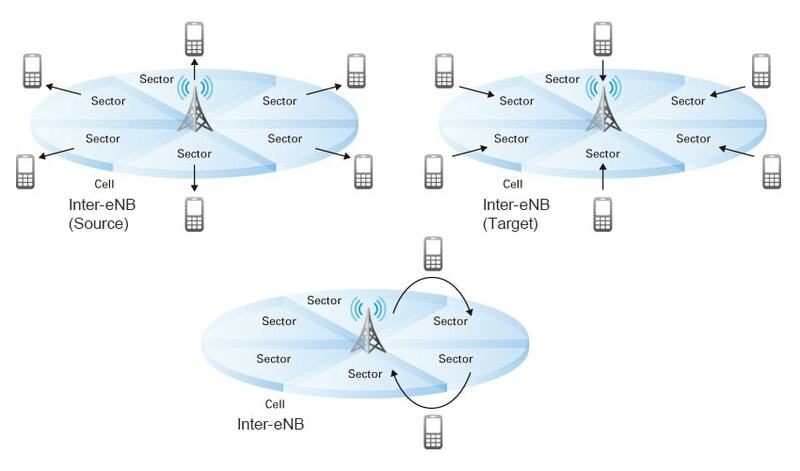 LTE eNBs must execute handovers both within the E-UTRAN (inter/intra-eNB) and between legacy Radio Access Technologies (RATs) such as UMTS. Inter eNB Handover (Source) Handover within an E-UTRAN. 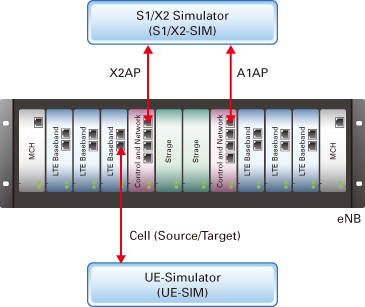 The procedure for when a UE is leaving a cell managed by the eNB and entering a cell managed by a second eNB. Inter eNB Handover (Target) Handover within an E-UTRAN. The procedure for when a UE is entering a cell managed by the eNB from a cell managed by a second eNB. Inter RAT Handover (Source) Handover from an E-UTRAN to a different RAT. 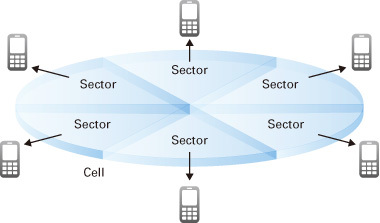 The procedure for when a UE is leaving the E-UTRAN cell. Inter RAT Handover (Target) Handover from an E-UTRAN to a different RAT. 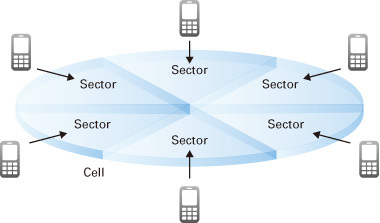 The procedure for when a UE is entering the E-UTRAN cell. Intra eNB Handover (Source) Handover from one sector to another managed by the same eNB. The procedure for when a UE leaves the sector. Intra eNB Handover (Target) Handover from one sector to another managed by the same eNB. The procedure for when a UE is entering the new sector. The figure below shows the test configuration for inter-eNB and inter-RAT Handovers. 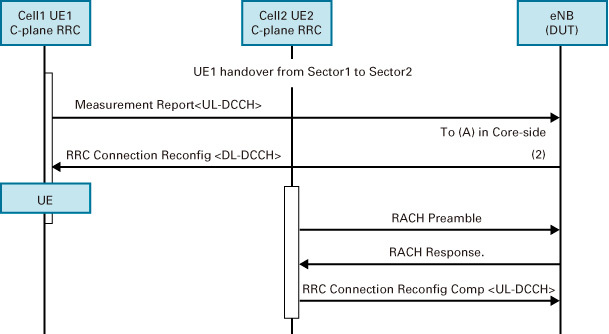 There are two types of procedures that can be tested in this configuration: “Source,” and “Target.” In the Source procedure the UE exits the cell, and in the Target procedure the UE enters the cell. The eNB (DUT) connects to the S1/X2 Simulator with X2AP and S1AP interfaces, and also connects to the UE Simulator. Source and Target procedures can be tested with the same configuration. “Inter RAT (Source)” and “Inter RAT (Target)” handovers can also be tested in this configuration. Intra-eNB handovers use a slightly different test configuration, shown in Figure 3 below. When a UE leaves an eNB cell to a cell controlled by a neighboring eNB, it’s called an Inter-eNB (Source) handover. The charts below show the messaging and procedures used for testing Inter-eNB (Source) handovers. The procedures and the test configuration are identical for Inter-RAT (Source) handovers. If an eNB receives a UE (the UE enters the eNB’s cell) from a neighboring eNB during a handover, it’s called an Inter-eNB (Target) handover, because the eNB is the “target” of the handover. In the charts below you can see details of the messaging and procedures involved in an Inter-eNB (Target) handover. The procedures and the test configuration are identical for Inter-RAT (Target) handovers. When a UE moves from one sector to another sector that is managed by the same eNB, it’s called an Intra-eNB handover. The chart below shows details of the messaging and procedure for Intra-eNB handovers.